On Friday 10th July (true to form) Lord Lawson called for the refusal by Lancashire Council for planning permission to allow Cuadrilla to frack to be overturned. Lord Lawson and been a strong pro-fracking and climate change denial influence in the national media since 2009 when he launched the GWPF. Read more about it at DesmogUK. It might not be obvious that rather than David Cameron or George Osborn it has been Lord Lawson and his Global Warming Policy Foundation which has led the pro-fracking / pro-fossil-fuel / anti-climate-science assault in the British media. The GWP-Foundation and the GWP-Forum generate pro-fracking & anti-climate-science news, aided and abetted by anti-climate-science blogs, which is taken up by journalists in papers such as the Telegraph (Christopher Booker), the Daily Mail (Christopher Booker), The Times (Matt Ridley) whose articles are then re-reported by the GWPFs in a maelstrom of nonsense to confuse and misinform the public. As a former journalist Lawson knows exactly how to do this. The GWP-Foundation (Director Dr Benny Peiser) eventually fell foul of the Charity Commission which ruled that “The website could not be regarded as a comprehensive and structured educational resource sufficient to demonstrate public benefit“, and so the GWP-Forum was spun-off (Director Dr Benny Peiser) to continue the misinformation party. So how have the GWPFs promoted fracking and how is local journalist Christopher Booker involved? The GWPF were quick off the mark in 2011 with Matt Ridley’s GWPF report ‘The Shale Gas Shock’ followed up by relentless pro-fracking / anti-climate-science web posts. (NB Matt Ridley writes reports for the GWPF and is on their ‘Academic Advisory Council’ despite the fact that the GWPF has no academic credentials. He also sits in the Lords and writes for the Wall St Journal). Taking a sample of all of the GWPF’s web site news stories between 10th March and 3rd July 2013 paints a picture of the cynical promotion of shale gas. During this period there were 633 website postings from 235 discrete sources. A great many of the news items represented are journalistic reportage, journalistic opinion, and climate sceptic blogging. They are based on existing information from the web cherry-picked to support the GWPF’s climate sceptic, pro-fossil fuels, anti-renewable energy position – all in the name of “educational charity”. 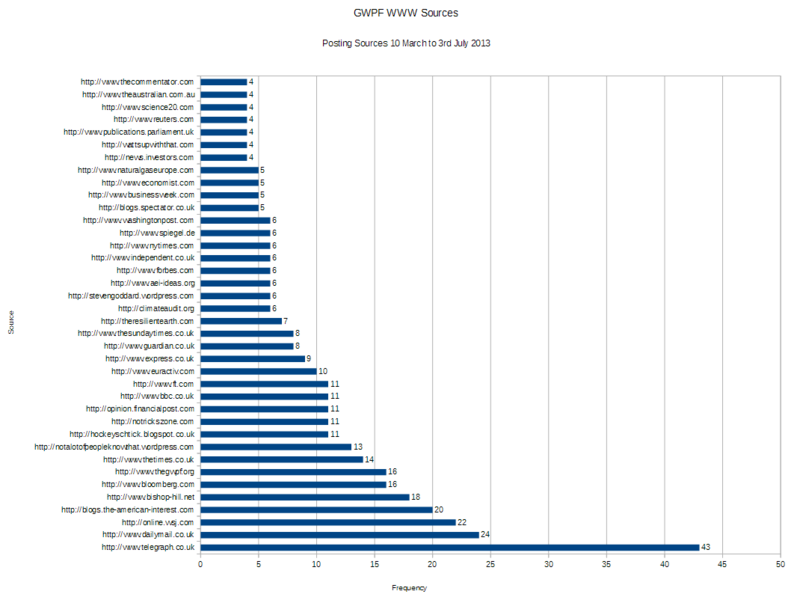 So, during this period what was the top topic of the GWPF’s web site postings? 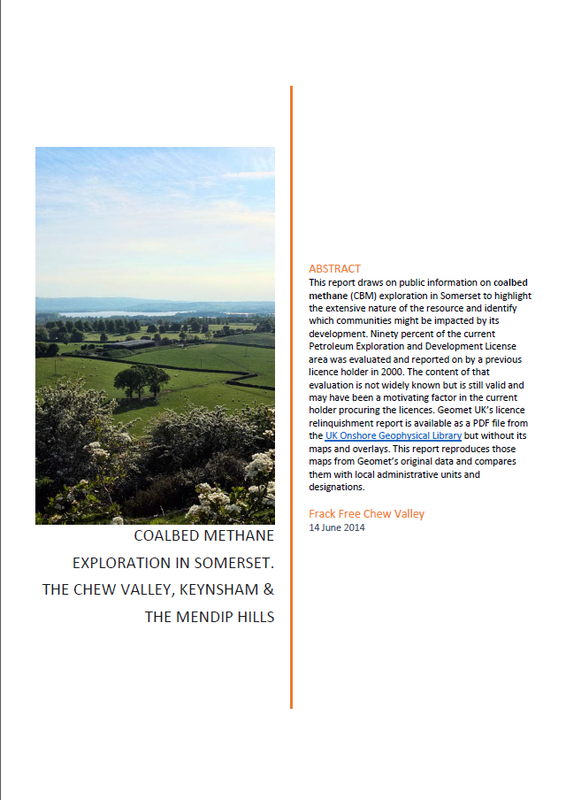 Given the GWPF’s mission you might be forgiven to expect it to be high quality analysis of climate mitigation policies but no the subject most frequently reported on is Shale Gas. What were the main sources of this information? 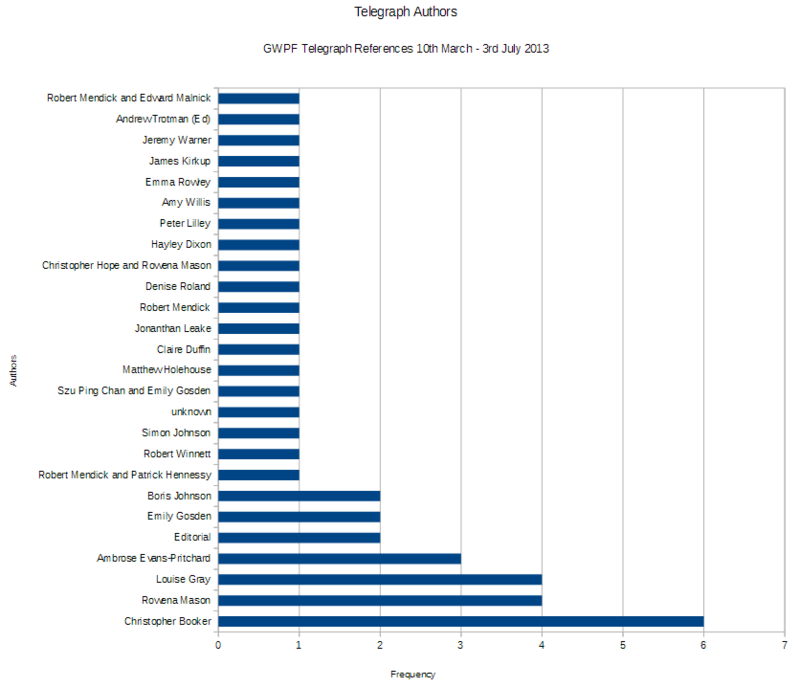 The first 5 most frequently referenced sources are: The Daily Telegraph, The Daily Mail, The Wall St Journal, The American Interest Blog and the Bishop Hill Blog. So if the Daily Telegraph is the most often referenced source who is the most often referenced journalist in the Telegraph? It is local journalist Christopher Booker. Who is Christopher Booker? Christopher Booker is a Somerset based journalist who writes regular anti-climate-science and pro-fracking articles in the Telegraph and the Daily Mail. He has also written a number of the GWPF’s anti-BBC reports. Note that the GWPF ignores any Telegraph article that is not climate sceptic or which is pro-renewable energy. Together with others such as the Bishop Hill Blog’s Andrew Montford, who also writes reports for the GWPF, the GWPF and its associates such as Booker and Ridley weave a tautology of pro-fracking anti-climate-science hyperlinks that inflates itself out of all proportions to become a vocal minority in the news media. This vocal minority has a disproportionate influence on public and MP opinion to the extent that party policy may be perverted. The withdrawal of subsidies for onshore wind being a case in point. The GWPF’s call for the government to treat shale gas as Nationally Significant Infrastructure Projects, giving the Secretary of State the final say on planning rather than local councils, is an ominous sign of what may be to come. 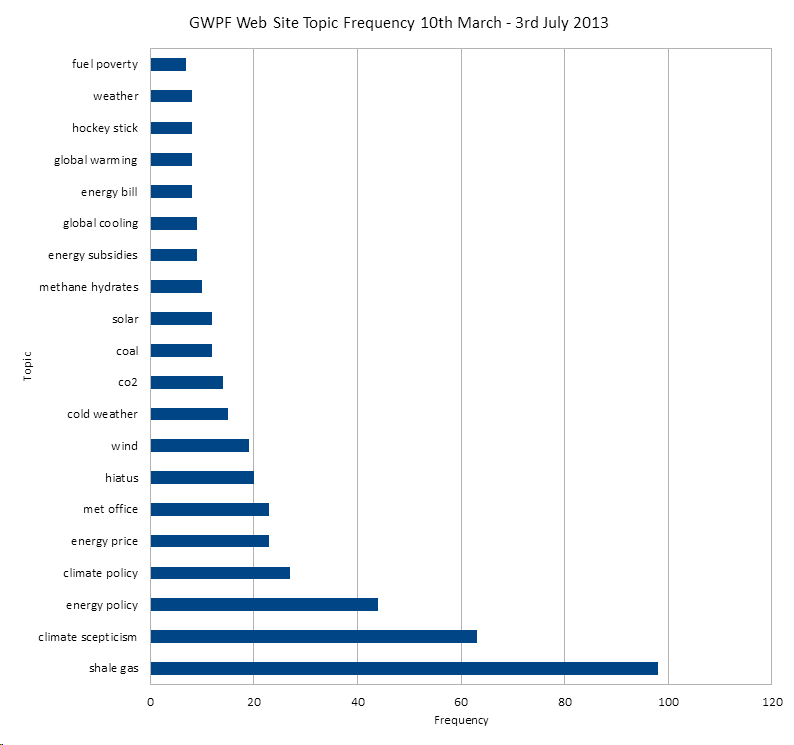 NB The graphs and stats in this post is based on the content of the GWPF web site between the 10th March and 3rd July 2013. Today Lancashire Council refused planning permission for Cuadrilla’s application to drill and frack near Preston New Road near Blackpool in what may be a watershed moment for the industry in the UK, although Cuadrilla may still appeal the decision. Read all about it in the Telegraph and the Guardian. It is not over yet though. Lord Lawson’s climate skeptic fossil fuel lobby organisation the Global Warming Policy Forum (GWPF) (not to be confused with Lord Lawson’s climate skeptic fossil fuel lobby organisation the Global Warming Policy Foundation (GWPF)) immediately called for shale gas to be treated as Nationally Significant Infrastructure Projects to enable Ministers to override local decisions. The GWPFs are at the forefront of the UK’s pro-fracking, climate change denial propaganda machine and work closely with local journalist Christopher Booker in churning each others’ news stories through the press. Booker has also written a number of the GWPF’s reports. In 2014 the Charities Commission ruled that the GWPF was guilty of breaking its rules by blurring fact and comment, which led to the split between the GWPF (10 Upper Bank St, London) and the GWPF (10 Upper Bank St, London). In 2012 Sir David Attenborough said of Lawon’s climate views that “Certainly I think that most people would recognise that Lawson is up a gum tree“. Lord Lawson sits on the Lords Economic Affairs Committee which has promoted fracking through its various reports. No confusion then between the GWPF and the GWPF or Lord Lawson’s role running pro-fracking lobby organisations and his role as a member of the House of Lords influencing law making around fracking.